Ohio State had a rollercoaster of a recent stretch coming into tonight. Eight days ago, the Buckeyes had their biggest win of the season: a 20-point victory against then-No. 22 Iowa. Four days later, and Ohio State had its most emphatic defeat with a 86-51 demolition to then-No. 14 Purdue. The difference: an indefinite suspension to sophomore forward Kaleb Wesson, the Buckeyes’ leading scorer and rebounder. Against Northwestern, Wesson sat out again. Against Northwestern, Ohio State (18-12, 8-11 Big Ten) lost again, falling to the Wildcats (13-17, 4-15 Big Ten) 68-50. It was Northwestern’s first win against the Buckeyes at home since Feb. 18, 2009. After an abysmal start for Ohio State offensively, the Buckeyes brought the game to within five in the second half following a 3 by freshman guard Duane Washington. But Northwestern remained in control from there, going on a 10-0 run after the Washington 3 on the way to securing its first win in its past 11 games. The Buckeyes shot 26.6 percent overall on the night, their worst shooting percentage in any game since shooting 26.2 percent from the field against Michigan State in 2012. The loss to the Wildcats is Ohio State’s second game shooting less than 30 percent from the field in the past 10 seasons. It took 14 attempts and 8:51 for Ohio State to make its first field goal of the game, and the Buckeyes never got much hotter from there. Other than redshirt senior guard Keyshawn Woods, who hit 2-of-5 from the field, Ohio State made 8.6 percent of shot attempts in the first half, making 1-of-12 from 3. Woods finished as Ohio State’s leading scorer with 15 points on 5-of-11 shooting. 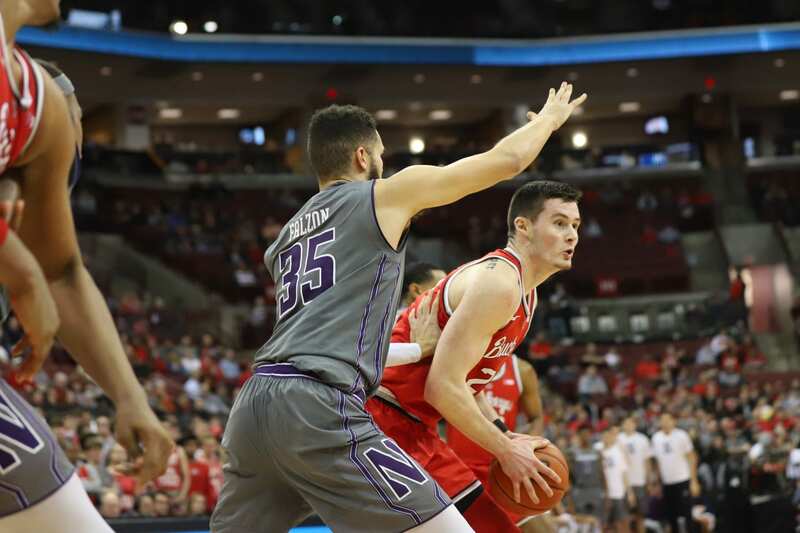 Northwestern did not take advantage of the Buckeyes’ poor shooting, hitting 39.3 percent of its shots and taking only an 11-point lead into halftime. The Wildcats also had 11 first-half fouls, giving Ohio State eight makes in 12 tries from the foul line. Junior guard Andre Wesson struggled mightily in the game, missing all eight attempts from the field, finishing with two points on a pair of free throws. Midway through the second half, the offenses began to heat up. Ohio State and Northwestern exchanged baskets between a pair of layups by sophomore forward Kyle Young and a 3 by senior guard C.J. Jackson to bring the game to 43-35 in favor of the Wildcats. Young had to leave the game at the end of the first half after aggravating a knee injury, but he returned to finish with seven points and four rebounds in 26 minutes of play. The Wildcats relied on their two leading scorers down the stretch. Redshirt senior forward Vic Law and senior center Dererk Pardon led the way for Northwestern with 10 and 20 points, respectively, also combining for 19 rebounds. Pardon scored 18 of his points in the second half. Ohio State will finish the regular season against No. 21 Wisconsin at home at 2 p.m. Sunday.